In this summer heat, I’m drawn to the simplest meals. (Read: the less I have to turn on the stove, the better!) That often means lots of salads; grain, bean, green, etc. Sometimes the salad sneaks itself into sandwiches, or this case a pita-nini. My family spent a lot of time living in the Middle East (my grandfather worked for the United Nations) so the pita became a staple in our home. It seems more manageable to me than chunky slices of bread which seem more suitable to the colder months. 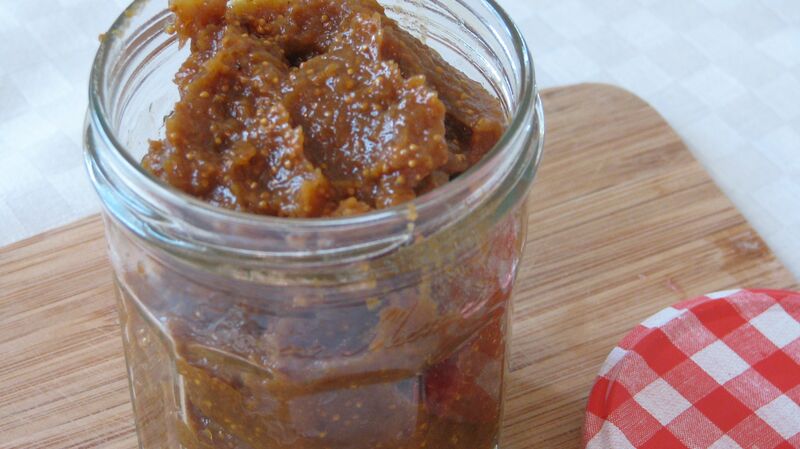 In any case, thinking about the fig spread in the fridge brought about this experiment. There are 3 stars in this show: the fig, the robusto* and the arugula. I’d like to concentrate on the dark leafy green that is also known as rocket. It’s one of my favorite of the cruciferious veg (if you stick around long enough you may find I say this often) and in early summer it’s positively addicting. Cruciferous vegetables are widely known anti-carcinogens. Their potent phytonutrients help the enzymes that “ward off carcinogens and other outside invaders, inhibit cancer formation, detoxify carcinogens and protect against colorectal, stomach and respiratory cancers”.¹ Like other dark leafy greens, arugula is an excellent source of calcium, iron, copper, magnesium and anti-oxidant vitamins A and C. They are also wonderfully endowed with the B-vitamins, especially folate. And, let’s not forget fiber. There’s plenty of it here! What’s amazing about a food that is so nutritious is that it is bursting with delicious flavor! It’s peppery and spicy even. It’s amazing raw in salads, in sandwiches, in pesto (move over basil!) or, when cooler days arrive, cooked in stir-frys and soups. However you choose to incorporate arugula into your diet, your body will be thankful as will your palate. Love it when everyone is happy! 1. Cut off about 1″ off the top of the pita and open the pocket. 2. Spread 2 T (approx) onto bottom half of pita then top with arugula and cheese. 3. If using an actual grill (lucky), brush some olive oil on each side of pita bread and place on grill (medium heat) with a plate or pan on top to hold it down. If using a sauté pan (medium heat), do the same or use butter. Each side will take about 4 minutes or until bread is crispy and cheese is melted. 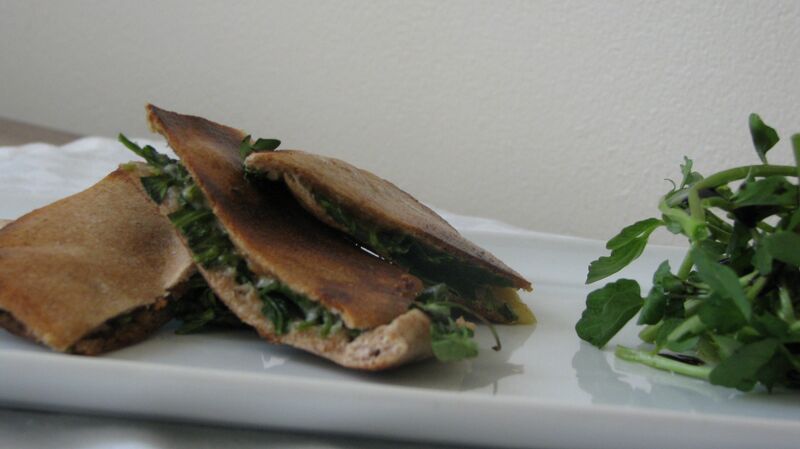 Lastly, if you have a panini maker, put it to good use with this yummy pita-nini! *Robusto – I ran into this cheese not quite sure what I was looking for. I should say then that the cheese found me because once I tasted it, I knew it had the right amount of sharpness with soft edges for this pita-nini. It’s a bit sharper and harder than a gouda. Super yummy though!